Includes computer selected springs for snow plow application and 140A alternator (w/6.0L diesel engine). Restrictions apply - see Supplemental Reference or Body Builders Layout Book for details. 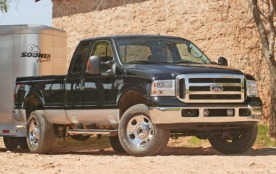 Includes 6.0L V8 turbo diesel engine with 325 hp @ 3,300 rpm and 570 lb-ft of torque @ 2,000 rpm and engine block heater. Includes 3-valve, 6.8L V10 gas engine with 362 hp @ 4,750 rpm and 457 lb-ft of torque @ 3,250 rpm. Limited Time Special Price includes four (4) LT265/70R17E all-terrain, black sidewall tires and one (1) matching spare tire. Limited Time No-Charge Upgrade includes four (4) LT265/70R17E all-season, black sidewall tires and one (1) matching spare tire. 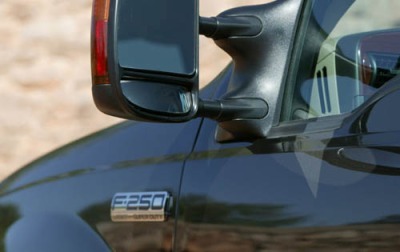 Includes transmission power take-off provision. Requires aftermarket power take-off accessories. 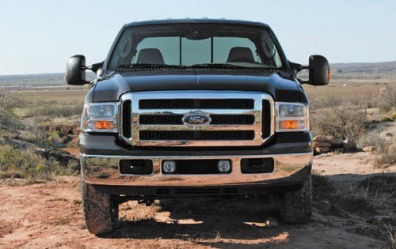 Power take-off unit may be obstructed by catalyst placement on 6.5L and 6.8L gas engines. Includes chrome front and rear step bumper with lower center trim, single-beam jewel effect headlamps, underhood service light and bright chrome hub covers w/center ornaments.